With thanks to his wife for patience and to the editor for helpful commentary. 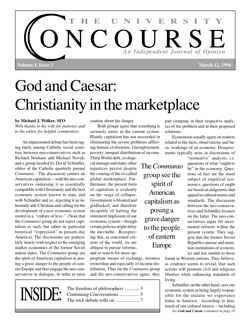 An impassioned debate has been raging lately among Catholic social scientists between neo-conservatives such as Richard Neuhaus and Michael Novak, and a group headed by David Schindler, editor of the Catholic quarterly journal Communio. The discussion centers on American capitalism—with the neo-conservatives endorsing it as essentially compatible with Christianity and the best economic system known to man, and with Schindler and co. rejecting it as inherently anti-Christian and calling for the development of a new economic system rooted in a “culture of love.” (Note that the Communio group do not reject capitalism as such, but rather its particular historical “expression” in present-day America). The discussions are particularly timely with respect to the emerging market economies of the former Soviet nation states. The Communio group see the spirit of American capitalism as posing a grave danger to the people of eastern Europe and thus engage the neo-conservatives in dialogue, in order to raise caution about the danger. Both groups agree that something is seriously amiss in the current system. Plainly capitalism has not succeeded in eliminating the severe problems afflicting human civilization. Unemployment, poverty, unequal distribution of income, Third World debt, ecological damage and many other injustices persist despite the coming of the so-called global marketplace. Furthermore, the present form of capitalism is evidently on the verge of collapse. Government is bloated and gridlocked, and therefore incapable of halting the imminent implosion of our economic system—though certain policies might delay the inevitable. Recognizing this, as concerned citizens of the world, we are obliged to pursue reforms, and to search for more appropriate means of exchange, resource ownership and especially of income distribution. Thus far the Communio group and the neo-conservatives agree; they part company in their respective analyses of the problem and in their proposed solutions. Economists usually agree on matters related to the facts, observations and basic workings of an economy. Disagreements typically arise in discussions of “normative” analysis, i.e. questions of what “ought to be” in the economy. Questions of fact are the usual subject of empirical economics; questions of ought are based on judgments that appeal to cultural norms and standards. The discussion between the neo-conservatives and Schindler focuses on the latter. The neo-conservatives argue for incremental reforms within the present system. They suggest that the former Soviet Republics pursue and maintain institutions of economics and law similar to those found in Western nations. They believe, as evidence seems to reveal, that such actions will promote civil and religious liberties while enhancing standards of living. Schindler, on the other hand, sees our economic system as being largely responsible for the malaise we experience today in America. According to him, much of our cultural misery—including poverty, racism, and homelessness—is nothing other than the inescapable consequence of the flawed deistic epistemology and metaphysics of America’s founders. He concedes that the founders did not intend the moral crisis, but thinks that their “understanding of the person, society, and God, and the way of life embodying this understanding, has ‘logical’ implications which they did not foresee.”1 The logic of capitalism, in his view, tends toward the evils of greed and materialism. “Western liberalism appeals to appetite. Liberalism creates a society that can satisfy all your wants.”2 Thus, he calls for a radically new economic beginning based on a highly developed theological anthropology and the social teachings of the Church. The answer to the crisis, he tells us, is Christ. The implication of the answer is society-wide transformation, change of heart and a revamping of the social milieu—meaning nothing less than total conversion of society at every level and in every institution. Government, business, banking, financial markets, insurance industries, the family, education systems and every market exchange would be altogether different in a truly Christ-centered culture. Schindler wants efforts toward the renewal of culture to be based on a right understanding of man’s relation to God. For instance, he insists that our ills arise partly from a disordered emphasis on man’s creativity as opposed to his receptivity, which should be primary. As a Catholic, I have a lot of sympathy with Schindler’s view, but as a Catholic economist, I think there are serious problems with it, both in theory and in practice. I object especially to the condemnation of an economic system as a whole, because of its particular cultural deficiencies. But before I get to my criticisms, I want to clarify the meaning of the term capitalism. (It seems to me that ambiguity in the term has caused a lot of unnecessary confusion and misunderstanding on both sides.) Let me offer a basic definition for a starting point, and then proceed to draw some implications which, to me, seem to undermine Schindler’s position. property, an authority that protects this institution or provides a mechanism of reparation when the right of private property is violated, and freedom of exchange. Capitalism uses a market system for organizing resources and distributing wealth, goods and services produced. Our present experience of capitalism in most western industrialized nations, however, is not that of a pure capitalism. Rather, nations like the United States, Japan and Germany are usually thought of as mixed capitalist economies. This is due to public policies that regulate resource and product markets (e.g. antitrust policy and labor laws like the minimum wage), redistribute income (AFDC), and attain control of resources (e.g. federally operated transit systems.) Such public intervention is justified when the market system fails to achieve certain goals. This definition of the economic system is rather simplistic. Even so, it may serve as a reminder that when we discuss culture, economic systems play the part of serving society’s material needs. Now, let us consider Schindler’s call to reform. He correctly anticipates some criticism of his argument by indicating that reform must be proposed rather then imposed. The truth, he reminds us, is liberating. Nevertheless, let me offer two reasons why I think his theory remains flawed. 1) The economic system we live in should not be conceived as simply the necessary outgrowth of a particular idea, but rather as the result of innumerable concrete choices made by individuals day by day. 2) His proposal for reform, while offering the ideal toward which a society may strive, is unrealistic, especially considering the pluralism of American society. Let me try to explain what I mean. Working within a given state of economic circumstances, people freely experiment with different options; they take advantage of varying opportunities; and they take risks. Sometimes these experiments lead to success, other times to waste and ruin. But people learn from experience. When particular decisions bring forth good fruit, knowledge about such “right” decisions spreads through the social framework. I suggest, then, that the economic system has progressed to its current state by the accumulation of millions of experiments (free personal choices and acts) yielding results over time. I do not mean to suggest that the present state of the economy has nothing to do with ideas—only that it has less to do with ideas than Schindler seems to say. And, to the extent that it is a by-product of particular ideas, I would say current American capitalism is much more a product of the last fifty years than of our founders’ principles. Further, I think this empirical analysis can be extended to the broader societal construct of culture, implying, I believe, that part of the fault lies with the Church, which has failed to evangelize the culture. The failure to account for human freedom misdirects the attack on American capitalism. The Founders may have predisposed us in a certain direction, but we were free all along to rise above their limits and receive the truth. There are four reasons why I think Schindler’s theory (and his call for reform) is unrealistic. First, from the point of view of practical alternatives: Schindler doesn’t ask whether we might not be worse off had capitalism not been in place. Might it not be the case that without a capitalist economy, our social ills could have been still more intense, affecting many more persons to much greater degree? Isn’t it at least feasible that the duration, severity, and extent of our economic difficulties would have been much greater had we had different system in place? Second, from the point of view of actual possibilities, Schindler proposes radical transformation without enough emphasis on the fact of sin. As long as there is sin, the nature of the economic system will be to allow for opportunities of failure. Can emerging fruits of the Spirit become part of the social fabric? Of course they can, but sin remains; we cannot avoid its effects. Neither can people be forced to conform to the culture of love. It seems therefore impractical to expect the system to embody the culture of love within the framework of political, ethnic and religious pluralism of our society, which results from liberties guaranteed by the Constitution. Third, the theory is unrealistic because it places unreasonable demands on a system which can only do so much toward remedying human problems. The economic system is designed to perform only certain functions. And, as the Pope has said, many human needs are not present in markets. This is a reminder not to confuse markets with moral systems. To transform a social institution, society itself must be transformed. But transformation of society comes only with the metanoia of the inheritors of the Kingdom. Only then can markets become (only one of many) expressions of a receptive culture of love. This leads me to the last reason why I think Schindler’s theory is unrealistic. Reform must arise from individuals. I think Schindler makes this point, but only weakly. Redirecting the attack against the American expression of democratic capitalism ought to place priority on personal transformation, whereas he seems to make it almost an afterthought. persons on a widespread scale would surely mean economic reforms. But the crux of the matter is thus: renewal must begin with individuals, not economic systems. If we attempt the reverse, we will see the decline of liberty and the return of serfdom. I would welcome further discussion on this and related topics. Michael Welker is an Assistant Professor of Economics at FUS, an alumnus of the class of 1989 and a professed member of the Secular Franciscan Order.